Take a beautiful diamond engagement ring and add in these extraordinary Ceylon Sapphires for an exceptional piece of jewelry that will be adored for years to come. This ring is from Vanna K's Hand Engraved Collection of engagement rings. 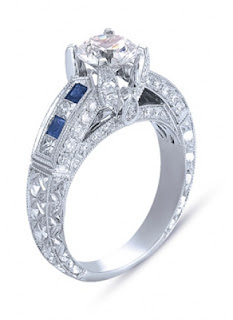 Expert artisans have hand crafted this piece for the perfect profile combining 3/4 carats of white hand-selected diamonds and 1/4 carats of Sapphires to maximize the sparkle from the 1 Carat round diamond center stone. This is the perfect ring for the woman who likes a little color in her life. Find this unique Diamond and Ceylon Sapphire engagement ring (Style # 18RGL0073SDCV) and other beautifully hand engraved rings at Vanna K.